*SOLD* This piece illustrates a beautiful clearing I found on a short hike in Evergreen CO. This scene really interested me for a number of reasons, the first being the how the thin blanket of snow accentuates the rock shapes and leaves small spots of exposed earth. The second is the dynamic trees that start so close to the viewer but seem to progressively drift off into infinity. Im finding that I really enjoy creating smaller and more intimate nature scenes more and more because of their potential for detail and a dynamic composition. *SOLD* This painting of Breckenridge served as a great exercise in using texture and scale to portray distance. I have had excellent experiences around this area involving skiing, hiking and camping so I was happy to bring this image to life. I find the rockies incredibly captivating while also humbling at the same time. This painting of crystal mill features the vibrant changing aspens as well as the signature vast Colorado sky. My goal with this piece was to work quickly and efficiently in order to get an energetic rendering without getting stuck in too many details. This is such an interesting location that can create a very dynamic composition in a painting. This image is particularly interesting to me because it features a old decaying man made structure amongst the flourishing natural surrounding. To me, this juxtaposition highlights the temporary nature of human creations and the longevity of our natural world. *SOLD* This painting of Mt. Sneffels started as a simple study but quickly evolved into a slightly longer project. Just like most landscape compositions this piece was an excellent exercise in foreground, middle ground and background and how to balance these components. In terms of my larger progression as an artist this piece was a great step into color without getting overwhelmed by it and letting it take over the piece. This cloudy mountain peak study was a great exploration in depth and contrast. While creating this piece I wanted to clouds and mountain peak to look visually dynamic and dramatic, while also showing a difference between the physically light clouds and the sturdy mountain. I plan on using this reference for a Terra Human painting soon! *SOLD* This study of Black Canyon CO, was a great exercise in capturing atmosphere and light and how they affect different rock surfaces. This piece was also a great exercise in color and how it changes because of atmosphere and distance. *SOLD* This landscape study attempts to capture the natural beauty I found in Breckenridge during an inspiring hike. The amazing distance is difficult to capture in a painting but I sure enjoyed giving it a try! This piece expresses my appreciation for the beautiful New Mexico scenery. I started this painting out in the environment and it was a real pleasure experiencing all of the sites and sounds of the Jemez National Recreation Area. While painting I was surrounded by young rock climbers and their instructors who were conquering the impressive rock faces with determination and laughter. Painting this piece outdoors strengthened my relationship with nature and inspired me to pursue more outings like this one. *SOLD* This piece expresses my gratitude for the beautiful state that I live in. Colorado has been a key source of inspiration for much of my work and it somehow always has new beauty to share. The Boulder flatirons in particular always catch my eye as something so incredibly unique and dynamic. I am excited to explore and discover even more unique places in this diverse state. *SOLD*This painting is a visual expression of how I view relationships. I really enjoy illustrating the relationship between land and water because in a way it is seamless and sometimes unnoticeable. Yet these very separate entities are complete opposites in their nature and they somehow come together to create beauty and harmony. The stable and consistent hills and mountains and abstracted through the reflections of the ever changing water to create an entirely new visual. *SOLD* This painting represents the concept of letting go. There are many experiences in our lives that we have no control over and the only thing we can control is our attitude. I can be helpful to let go of the things that are out of our control and switch our focus to the things that are in our control. This can help us live our days with purpose and not in fear. Young Brother and Old Brother were created simultaneously so I started to view the two of them as siblings. Just like human brothers theses paintings were continually learning and growing together but also dealing with mistakes and failures. They influenced each other for better or for worse and their identities are intertwined. Yet as much as these brother influenced each other they bring different types of beauty to the world. *SOLD* Young Brother and Old Brother were created simultaneously so I started to view the two of them as siblings. Just like human brothers theses paintings were continually learning and growing together but also dealing with mistakes and failures. They influenced each other for better or for worse and their identities are intertwined. Yet as much as these brother influenced each other they bring different types of beauty to the world. *SOLD* This painting encapsulates one of my favorite components of winter in Colorado. Being from Maui my first experience with snow was in Colorado Springs when a beautiful morning frost covered everything with soft fluffy snow. This piece aims to convey the soft silence that can be found in a snow-covered landscape. I find that this silence can encourage self reflection and a meditative state of mind. *SOLD* In my paintings I often draw my inspiration from intangibles such as emotions, concepts and mentalities but I sometimes find it is beneficial to go back to what first drew me into art in the first place. This would be awe inspiring landscapes because they bring me joy and make me think beyond myself and Glacier National Park certainly did this during my summer road trip. When viewing this in person I felt inspired to create a painting that could bring other people joy and reflective thoughts. This piece asks for humility and contemplation from it's viewer. The dynamic physical structures of our world have been in the process of creation for longer than we can comprehend. *SOLD* This commissioned painting was meant to highlight the vibrant colors found in a landscape and how they can inspire the viewer. The client wanted to see the changing colors in the aspen trees and how they contrast the pine trees. Working on this piece gave me a great appreciation for the time and effort it takes to replicate the subtleties of nature. 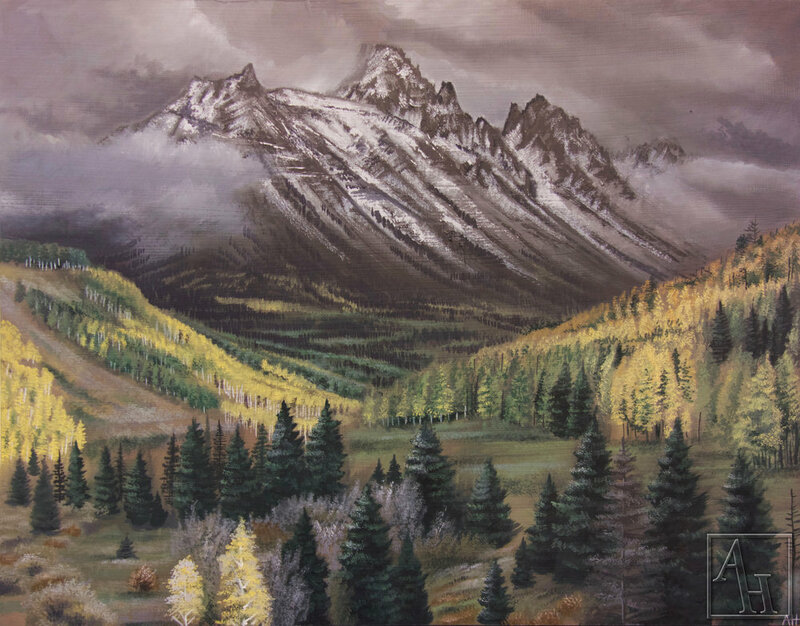 This piece was inspired by my first impressions of Crested Butte and the amazing landscape that surrounded the town. The peak seemed to loom over the town giving it a protective and inspirations presence. This piece was made to show the contrast of Colorado's pure natural environment and its new developing areas. Houses and neighborhoods are as expansive as the nature they cover. *SOLD* This piece was made to explore the light and feathery nature of Colorado Snow and how it interacts with dynamic landscapes. The grand nature of the entrance to Garden of the Gods frames the fading landscape. *SOLD* This painting was a slightly abstract representation of an already dynamic Colorado landscape. The organic brushwork allowed bushes and trees to twist and turn in a more impressionist fashion. *SOLD* This piece showcases the unique rock structures found in Garden of the Gods contrasting the expansive blue Colorado Sky. The harmony of foliage and sturdy rocks is also a predominant theme. *SOLD* This piece highlights the resistant plants that grow in the Colorado desert environment. This back view of Garden of the Gods shows how the landscape dips into a vast valley sprinkled with peaks of rocks. *SOLD* This painting focuses on the unique rock structures found in Garden of the Gods and how they fold and stack on each other. These rocks tend to frame the surrounding landscape now matter what perspective you look at them from. *SOLD* This piece was a brief departure from the more dramatic Colorado Landscapes and a focus on the vast plains that away from the Rockies. This expansiveness can make one feel small and humbled. *SOLD* This piece was a birthday present for my dad. It showcases the warm Maui sunrise and how it casts shadows on the lush tropical greenery.